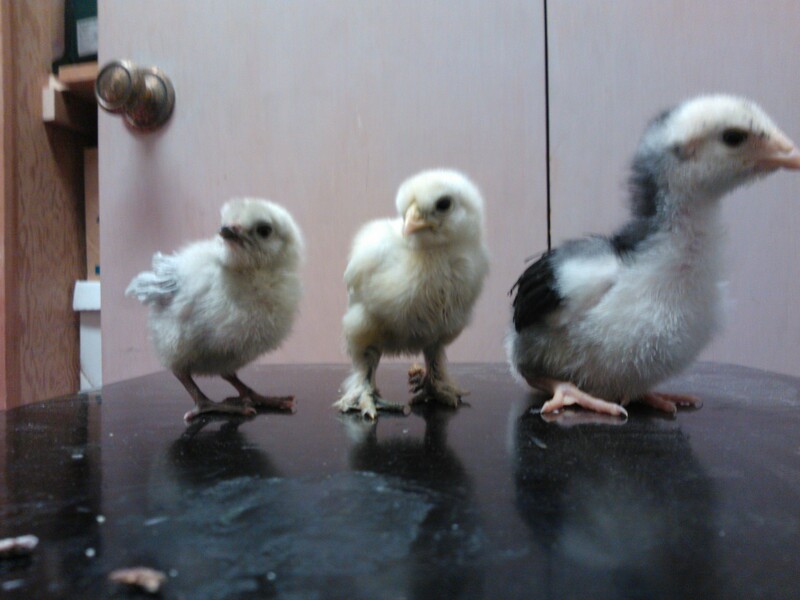 Bubbles, the Ameraucana; Greta, the Silkie and Esmerelda the Giant Orpington, back in April when we first got them. Driving down the winding road toward the chicken farm and our new chicks, we were all happy and full of expectations. I pictured a tidy barnyard with happy chickens running around. There would be a quaint old farmhouse surrounded by old oak trees. I thought that was where we were headed as I read directions, and we finally turned off the highway onto a dirt road. “There’s the house,” I said as the GPS pronounced, “You have reached your destination.” A new stucco house sat on top of a barren hill. “Look at the goats,” Samantha my youngest daughter announced, and sure enough maybe 50 goats came over the hill toward us, churning up dust as they stepped. They had eaten every plant in their pasture. “This isn’t right,” I said. “Where’s the chickens?” My husband was already turning the car around. We drove back to a fork in the road. A bearded man waved at us. He stood in front of a metal gate. “That’s it,” I said and waved back. The man opened the gate and shut it behind us after we drove through. We arrived on a dirt lot with several trailers, one tree and pens and pens of chickens. We parked in between the two trailers. The man had disappeared and no one else seemed to be on the property. “Meg?” I called, getting out of the car and peering around. There was no house, just piles of fencing, wheel barrels of chicken poop and rusty tin oil drums. Then a woman wearing what looked like hospital scrubs and clogs walked around the side of the trailer. A golden retriever and a German pointer bounded up barking. “You came to the right place,” she said. With ringlets of blonde hair, a wide face and blue eyes, Meg the Chicken Lady reminded me of a grown up Heidi of the Alps, but instead of goats, she had chickens. Many, many chickens. I held my hand out to shake hers, but she shook her head. As we lined up behind her for the tour, my husband looked at me with his eyebrows raised. “Quiet,” I said, but he hadn’t said anything. Meg started at the far left side of her lot, where a pig pen sat under a tree. “These are my pigs,” she said methodically. “And these are my turkeys.” Meg showed us each pen, naming off each animal as we came to it. After the turkeys, came the chickens. Lots of chickens. “Here’s your Leghorns, your Rhode Island Reds, your Lace Winged Wyandotte.” She went so fast, I could barely keep track of all the chicken breeds or see where she was pointing. As we walked, I noticed chicken poop dotted the back of Meg’s shirt. Now, I understood the East County Zoo referred us. Meg was collecting ONE of EACH kind of CHICKEN in the universe. As we continued on the tour, I realized there were maybe 500 birds, but it could have easily been 1,000. Did she mention she’d eaten it? Next there were the pens of meat chickens, bred to have such large chests that they could barely walk. They didn’t seem to be standing or moving around just huddling together under a small shade structure in their pen. They were white with red combs and huge protruding blobs of breast meat. Next she showed us her goats. Why did she have goats? “For fun, for the milk. I sell a little, drink a little.” The goats liked my youngest daughter and danced on their hind legs when she stuck her fingers through the fence. “I’ve never seen them do that before,” Meg said. “Stop!” I said, pulling Samantha’s hand out of the goat pen. “Where’s the Orpingtons?” I asked. Enough with the goats, I was eager to see the lavender chicks I had been searching for. Meg shook her head and walked us to another section of her chicken plot, where fences formed a large square, divided into maybe fifty pens, each with a different chicken breed flock. “Here’s your Australop, your Brahma, your Polish and your Showgirl.” She went so fast, I could barely keep track of all the chicken breeds or see where she was pointing. The tops of each cage were open with no chicken wire. “Don’t coyotes jump in and eat them?” my husband asked. We were out in the country. WE live in the city, yet our chickens are wrapped up in a fortress of chicken wire. My husband looked at me and raised his eyebrows. “Where’s the chicks?” the girls asked. I had lost sight of what we were doing I was so overwhelmed with her chicken operation. “Those are sure dusty,” I said. They were a little — disappointing. Did I really think they would be a soft shade of purple? They were gray, but more than that they were skinny, not like our big fat feathery fluffy Orpington at home. All this hunting on Craigslist and phone calls and driving all over. The vision I had of lavender chickens walking in my garden of blue flowers was fading fast. “Oh well, let’s get chicks. I don’t need a lavender one,” I said. LAVENDER, I realized, meant GRAY. GRAY chicken. Why in those posts on the Internet did they look so purple? My husband looked at me again with his eyebrows raised. “Really? We came all this way,” he whispered. “Let’s go to the chick house,” Meg said. “To the chicks!” the girls announced, and Meg led us toward the center of her property where a bunch of clutter and trash was piled on a wood structure with a tiny shed. The La Jolla Cove, for all its glamour, glitz and astonishing property values, really stinks on a summer day. If you drive down Coast Street, park and get out of your car to peer out at the ocean, there on the rocks where hundreds of pelicans and seagulls sit and seals and sea lions bask in the fog, it smells terrible. Without driving very far, if you live in La Jolla, you can catch a whiff of something very similar to the stench of a chicken farm. Imagine that smell bottled up and pumped into a little closet that is heated to 95degrees. That’s what we walked into to see the chicks. Picture a tiny trailer with linoleum floors and walls, and only room for the five of us (and the two dogs) to stand single file with the door open. Tall bookcase-like structures lined the walls. Each had five or six had drawers in them. As Meg pulled out the drawers, we saw that each was full of hundreds of peeping chicks. I had to get of that room. It gave me claustrophobia, and it smelled so bad I was going to pass out. My husband shook his head and excused himself right away. He hates the heat and I could see that he had instantly broken out in sweat. Meg was displaying chicks at rapid speed, capturing them in a small butterfly net and pulling them out for us to appraise. “How old is that one?” I asked because it really was HUGE. I remembered admiring some of the speckled black and white chickens when we first walked in, before I got overwhelmed. She was right. “I’ll take it!” I said “That’s mine. “As I left, I thought I heard Meg say something about it being a GIANT. She assured me it was. I headed outside and the door shut behind me. I left my children in there with the chicken lady, I thought. We both sighed as we stared at a wheelbarrow full of chicken poop and dirty rags. Meg held my Orpington and began looking for a box to put it in. “WHAT?” my husband and I both said. “We only have chickens for eggs,” my husband said. “They have to go back. I need big eggs.” He frequently bragged about his daily three egg omelet. With our egg production down now, he was lucky to get one omelet a week. Our littlest daughter had tears, “big crocodile tears” is what my husband calls them, forming in the corners of her eyes. “But I love him,” she said, looking at her little lemon yellow fluff ball. It really was cute. “I can’t put him—her—back.” She peered up at her daddy. This time I went back in the chick house with them. Meg opened up a door and rummaged around. She captured a few in her butterfly net and held them up. Abby shook her head. Meg tossed them back in. “We’ll take it!” I practically screamed and turned to exit the room as fast as I could. My smirking husband waited outside. “That one’s extra,” Meg said. Of course, it was extra. “Now how do you know if these are hens or roosters?” My husband. He thinks of everything! Obviously not, you can never have just one chicken. You get one chick, which leads to two chicks, which leads to two thousand chicks…. “Give me another ten.” I said, and grabbed it from his hand, gave it to Meg. “Thanks,” I yelled. My door barely shut, my husband stepped on the gas as if he could not drive away fast enough. Fortunately, the gate was now open, and we peeled out with a great cloud of dust. I felt thankful to get out of there with just three chicks regardless of their size or color or if they were roosters or hens. “I always wanted a chicken that laid blue eggs.” I said to no one in particular. As we turned onto the main road, my husband began laughing uncontrollably, the way you do when you are a kid and you have escaped getting caught pulling prank. “How did you find that place?” he asked through his laughter. “East County Zoo!” I said. “THE EAST COUNTY ZOO,” I yelled, now laughing too. I thought he was going to drive off the road. “It’s a chicken guy, not a zoo.” I was snorting and smiling so much that my cheeks hurt and tears formed in the corners of my eyes. Taking in a deep breath so I could speak, I said, “If we got a rooster, I’m throwing it over Meg’s fence. I’m never going back there.” I shook the way a horse shakes its hide to get the flies off. 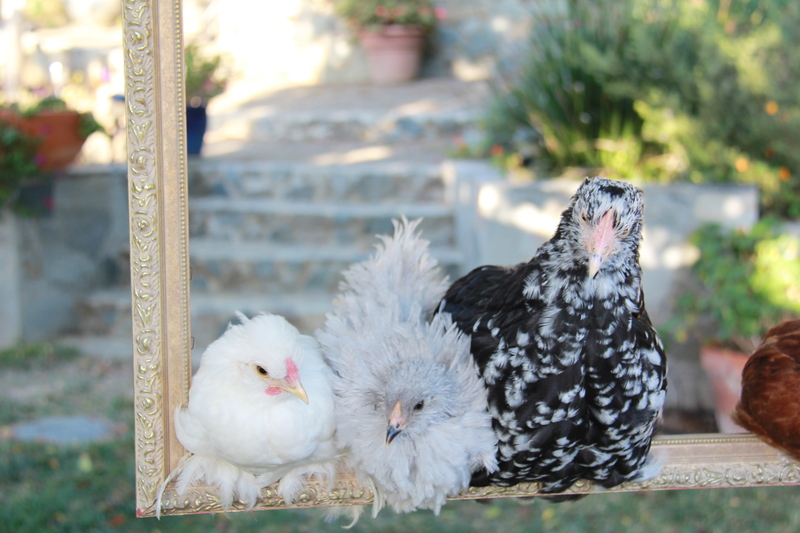 Greta (now called Grr because we think he’s a rooster), Bubbles, who turned out to be a frizzle, and Esmerelda, the giant, two months later.